Sugar Laned, Texas Juvenile Law Attorney James (Jim) Sullivan is an experienced Defense Lawyer. Fort Bend County Texas Criminal Lawyer Jim Sullivan has successfully fought the government in Jury Trials on behalf of clients in criminal and juvenile courts since 1994. Jim Sullivan has a good reputation in the legal community. Jim Sullivan is humbled by fine lawyers who endorse him on AVVO. He is also very grateful for clients who write testimonials on his behalf. Most of his business comes from referrals from past clients and other lawyers, although it is not necessary to have a referral for him to defend you. Anyone can call Jim Sullivan to represent them. The law practice of Jim Sullivan is devoted solely to criminal and juvenile defense. Jim Sullivan has tried many cases in the Harris county criminal and juvenile courthouses. Approximately half of his cases involve criminal charges while the other half involves juvenile charges. If you are charged with a felony offense, Jim Sullivan may be able to get your case no billed (dismissed) by the grand jury, but you need to hire him before or soon after your first court setting . If your felony case is dismissed by the grand jury, you have the immediate right to get your criminal record expunged. Many of Jim Sullivan’s clients have been able to do this within a few months of being arrested. 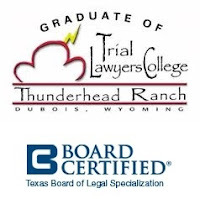 Richmond Juvenile Attorney Jim Sullivan is Board Certified in Juvenile Law by the Texas Board of Legal Specialization. Juvenile law is different than criminal law. Note: Among the more than 83,000 active lawyers in Texas, there are only 38 lawyers Board Certified in Juvenile Law in private practice. Jim Sullivan is fluent in Spanish and English, having studied Journalism, Latin American and Asian Studies at Baylor University, a nationally ranked Christian school. He graduated with honors in 1990. He then lived in Mexico City and traveled throughout Mexico prior to entering law school. In 1993, he graduated from South Texas College of Law. He and his wife Araceli have been married over 20 years and have two children. They worship at a local Catholic Church. Sullivan is also an Eagle Scout.